Have you always wanted to offer a textured surface, one that required a high level of craftsmanship. Thanks to new HI-MACS Structura technology, HI-MACS® can take on virtually any pattern – and do so with the utmost precision. Renowned for its quality, flexibility and limitless design possibilities, HI-MACS® is widely used within domestic and commercial projects worldwide. Now designers, specifiers and architects can benefit from a new innovation – HI-MACS Structura. 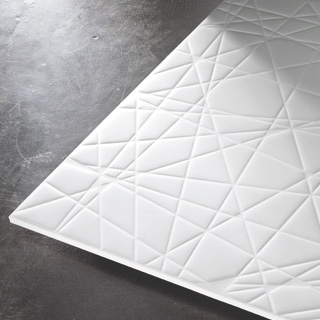 This new 3D textured material takes solid surface opportunities to a new level with a variety of standard designs as well as bespoke, custom made creations to suit any project. The next dimension in surface structure, HI-MACS Structura creates unlimited new possibilities as surfaces can now appear with a stunning 3D texture. The collection is created using a new technology offered by LG Hausys to provide a top quality product with unrivaled teamwork and support. It comes in 10 attractive colours and 10 standard surface designs – from the hexagonal print of Hive to the pebble-like feel of Zen or the raised relief detail of Dunes. HI-MACS Structura is different because it provides a textured surface that can take on virtually any pattern, allowing designers and architects to design their own bespoke surface in a simple way, pushing the boundaries of design in a project. Precision made, it can be utilised as wall cladding in bathrooms, en-suites and spas as well as showers and wet-rooms. It can also be used as an exterior cladding or facade with large-scale patterns that create dramatic effect, even from a distance. For more information on Hi-MACS and how it can be used in your project, please have a look at the colour range here.